The lightly astringent scent of tea tree oil, steam-distilled from the leaves of the Melaleuca alternifolia plant, may not win any "best smell" awards, but its antimicrobial properties have been proven in a number of studies. Because of this, it's little surprise that tea tree oil pops up in everything from hand soap to acne treatments. Although this potent essential oil does have a few potential drawbacks, including allergic reactions in some people, it also packs many potential benefits. Although tea tree oil shows up in a number of topical applications, its acknowledged antimicrobial properties make it a natural fit for use in soap. For example, an <ahref="https: www.ncbi.nlm.nih.gov="" pubmed="" 30304862"=""> </ahref="https:>October 2018 study published in the Swiss journal Molecules, showed that whether used on its own or in combination with other known remedies, tea tree oil shows good promise for use against such challenging bacteria as multi-drug-resistant gram-negative bacteria and methicillin-resistant Staphylococcus aureus (MRSA). So one of the biggest potential tea tree oil soap benefits includes taking out bacteria that resist other antimicrobial agents — whether you're applying it to your hands or using it as a household cleaning agent. There's a growing body of evidence that tea tree oil is also a useful, natural treatment for acne. Consider an August 2017 study published in the Australasian Journal of Dermatology: The scientists found that use of topical tea tree oil gel products "significantly improved mild to moderate acne" with only minor, well-tolerated side effects that soon resolved on their own. While there are no notable studies — yet — about tea tree oil's use as a body wash, it stands to reason that it might also be useful for treating body acne. Although you can buy ready-made soaps made with tea tree oil, mixing up your own batch is a great way to save money while steering toward a very green cleaning method, for both your body and your home. Combine 1/2 cup liquid Castile soap and 1/2 cup distilled water with 1 tablespoon sweet almond oil, 1 tablespoon vitamin E oil, 15 drops of tea tree essential oil and 5 to 10 drops of lavender essential oil. Or you can simply add 10 to 15 drops of tea tree oil per cup of your favorite liquid Castile soap. This works as both a hand soap and a low-sudsing body wash. Tea tree oil's documented antimicrobial effects make it a very useful agent in natural housecleaning formulas, giving you a way to avoid the potential irritants in chemical housecleaning liquids. Mix 2 cups hot water with 1/4 cup lemon juice, 2 tablespoons white vinegar, 10 drops of tea tree essential oil and 5 drops of sweet orange essential oil. Mix 2 cups of white vinegar with 3 drops of tea tree oil for a disinfecting rinse that you can apply after your usual soap (with or without tea tree oil in the soap). You can even make a tea tree oil "soap" to clean your toilets. Alaska Community Action on Toxics recommends mixing 1/2 cup baking soda, 1/4 cup vinegar and 10 drops of tea tree essential oil to create a toilet bowl cleaner. Tea tree oil's benefits don't stop at your hands, body and house. Four weeks of treatment with a tea tree oil shampoo has been shown to be an effective dandruff treatment, and tea tree oil combined with lavender oil can be an effective treatment against head-lice eggs too. While some people use Castile soap on their hair — which means you can just continue with the hand soap recipe already given — you'll get better sudsing if you mix 10 drops of tea tree oil into an 8-ounce portion of shampoo base. Are you suffering from athlete's foot? Surprise — tea tree oil cream, applied twice daily for a month, is also effective at relieving the symptoms of this fungal infection. Not sure where to find shampoo base? It's often sold in health food stores, near spray bottles and soap molds or, at other times, alongside bulk coconut oil, cocoa butter and other "DIY body care" products. Tea Tree Oil as a Food Preservative? Tea tree oil's antimicrobial benefits extend a lot further than just cleaning your house or your body. For example, one day soon, tea tree oil might be used as a natural food preservative. In a January 2019 study published in the International Journal of Food Microbiology, tea tree oil was found to have good potential for preserving ground beef, because low concentrations of the oil were shown to be quite effective against Listeria monocytogenes. In another study, published in the journal Microbial Pathogenesis in December 2018, scientists found that tea tree oil shows noticeable antimicrobial effects against a variety of food-borne pathogens, making another strong case for its use as a food preservative. Tea tree oil is a popular subject for laboratory studies, some of which head in unexpected directions. For example, a January 2019 study published in the journal Cytotechnology showed that tea tree oil might have some promise as a chemopreventive candidate when used in topical formulations against melanoma and squamous cell cancers. Another study, published in Biomedicine & Pharmacotherapy in July 2018, showed that tea tree oil demonstrates in vitro anti-tumor activity on breast cancer cells, without showing cytotoxic effects on fibroblasts and peripheral blood mononuclear cells. With its ever-expanding range of potential health benefits, what's not to like about tea tree oil? First of all, despite its excellent safety record when diluted for topical use, tea tree oil is toxic when swallowed — so you shouldn't take it internally. Although allergic reactions to topical application of tea tree oil are rare, they sometimes occur. A September 2016 study published in the journal Contact Dermatitis showed that positive patch test reactions (contact allergies) to tea tree oil occurred with a prevalence ranging from 0.1 to 3.5 percent. The same scientists noted that tea tree oil has been the culprit in most (published) allergic reactions to essential oils since the first cases were reported in 1991 and that the contact allergy is most common in reaction to an application of pure oil. Cosmetics containing tea tree oil have been the culprit in a few cases, but they are markedly in the minority. Although tea tree oil is generally considered safe for topical use, especially when diluted, there are a number of side effects, aside from contact allergies, that might crop up in a small percentage of the population. These potential side effects include simple skin irritation, itching, stinging, burning, scaling, redness and dryness — similar to the side effects that were reported in a study of tea tree oil as a treatment for acne. The Mayo Clinic cautions that you shouldn't use tea tree oil if you have eczema. Here's another thing to watch out for: Although all tea tree oils are distilled from the same tree species, not every bottle of essential oil is actually 100 percent pure. Some may be mixed with other fragrance or carrier oils, so always check the label carefully to be sure of what you're getting; otherwise, your products won't have the efficacy — or the level of safety — that you expect. Even when you're dealing with commercially available, 100 percent pure tea tree oils, a November 2018 study in Current Microbiology showed that not all of them are created the same. 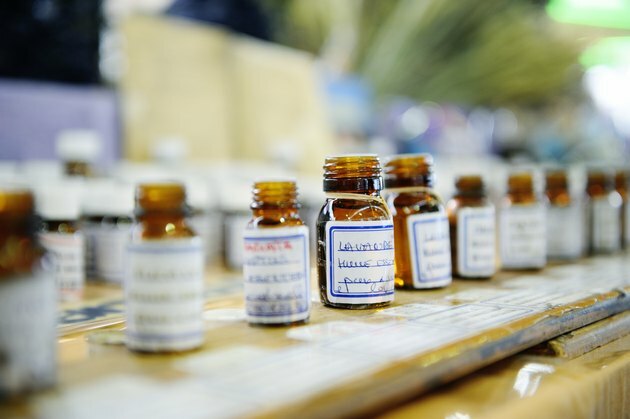 In that study, scientists found that only five out of the 10 commercially available tea tree oils they tested showed significant antimicrobial activity. This is, unfortunately, not entirely surprising, because essential oils fall under the heading of dietary supplements, which receive much more lax regulation than medications or even food additives. Dietary supplements (and thus oils) also don't have to go through extensive premarketing approval, meaning that the manufacturers aren't required to prove their safety or efficacy and that there have been a number of differences found between what supplements say on the label and what they actually contain. But there are some steps you can take to ensure that you're getting a pure product. First, shop from supplement companies that have a good reputation. The other step you may take is shopping from manufacturers who use a reputable third-party organization to test and certify the quality of their product and the accuracy of its labeling. Tea Tree Oil for Nursing Moms? Are you a nursing mother? Unfortunately the Drugs and Lactation Database reports that there is no data about the excretion of components of tea tree oil into breast milk, or its general safety and efficacy for nursing mothers and their infants. They do report that topical application is generally well tolerated, but because tea tree oil has estrogenic and anti-androgenic activity, you shouldn't apply it topically around the breast. What Is Tea Tree Oil and What Are the Benefits?